In this information age having latest news, information, data and analysis is critical to the success of any business. We at PolymerMIS provide you exactly with this for Polymer and Petrochemical Industries, to help you have an edge over your competitors and stay ahead of them in every segment. We bring to you on real time basis with breaking news as it happens, including market trends, quotes, moves, analysis, data, predictions and much more. We provide everything you need to know to stay informed and react to changing market conditions. We provide SMS and web based alerts for a wide range of petrochemical products and feedstock including Crude Oil, Naphtha, Olefin & Polyolefin, Aromatics and Petrochemical intermediates. Our commitment to provide you with reliable, authoritative and crisp information has helped us have a client database of over thousand subscribers who completely rely on us for all the update and industry happenings. Our customers comprise of large, medium and small scale industries, resin producers, processors, distributors, consultants, agents, traders, investment agencies as well as media companies. PolymerMIS is a trustworthy market and pricing intelligence resource that will help you make confident, informed decisions and save you that extra buck. Owing to our sound market intelligence and forecasts with due credits to our strong analysis team which gathers information from varied international markets we promise to make you feel more secure in global marketplace. 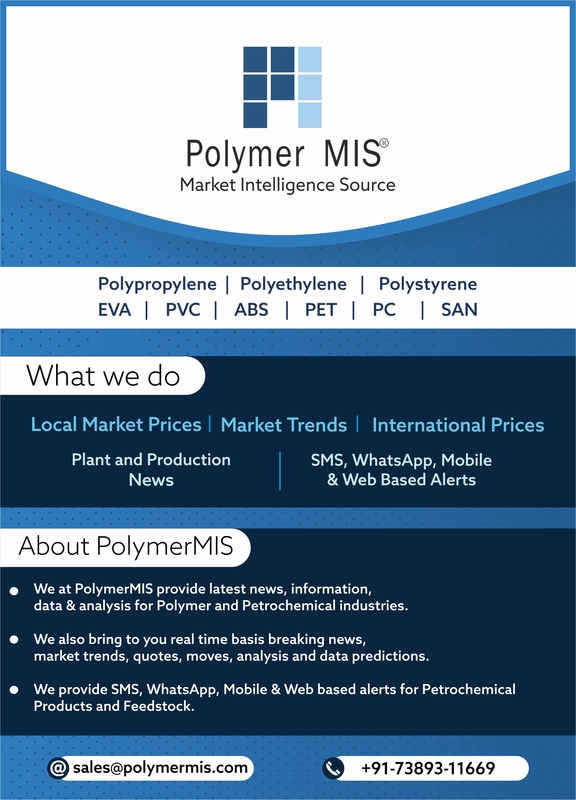 PolymerMIS will provide alerts for Aromatics (Benzene, Methanol, Styrene, Toluene, Xylene), Crude Oil (WTI Cushing, Brent, Dubai/Oman), Naphtha, Polymers (PP, HPDE, LDPE, LLDPE, PS, SAN, ABS, PVC, PET), Feedstock (Propylene, Ethylene, Ethyl Dichloride, Vinyl Chloride Monomer etc.) .